So many people ask us: do you move people to Greece from other countries, besides the UK? 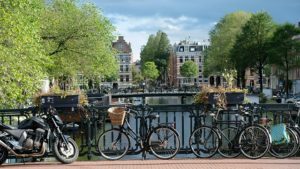 Our answer is “Of course!” Nomad’s overland route covers France, Belgium, the Netherlands, Luxembourg and Italy and we regularly move people both to and from these locations. It is just as easy as moving from the UK to Greece, and we use our own team, door-to-door, the whole way. 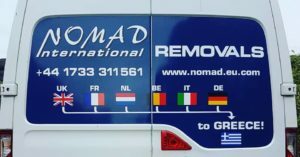 So many people move from the Netherlands to Greece, from Belgium to Greece, from Luxembourg to Greece and from France to Greece each year, and Nomad is the removal company of choice for these moves. As genuine specialists in Greece, while also being a professional British company, Nomad is trusted to do an outstanding job. France and BeNeLux are along our route (see below), making it very easy for us to collect and deliver just as we would in the UK. Many of our testimonials are from people from these countries, who have appreciated Nomad’s care and attention to this important time in their lives. Relocating to a new country on the other side of Europe sounds daunting, but with Nomad much of the stress of the move is removed, as you know you are in the capable hands of a company who does this all the time. In addition to relocations, Nomad also helps people from Italy, France, Belgium and the Netherlands furnish holiday homes in Greece all the time. If you are building a second home in Greece and would prefer to buy things in your home country (or to move furniture from your own house), we can collect your furniture from your home and deliver it to your second home in Greece, carrying everything into the right rooms of course. If the location is on a remote Greek island, it doesn’t matter, we can help! If the roads leading to your home are tight and narrow, don’t worry, we can help! We have many years of experience in removals to Greece so you can trust that we will get your belongings to your new home safely. 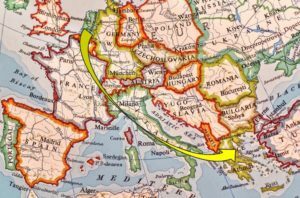 Besides France, BeNeLux and Italy we can also travel slightly further afield into Germany or Austria en route to or from Greece, still using our own team and vehicles the whole way. Not forgetting our favourite cousins in Ireland! We conduct many removals from Ireland to Greece and from Greece to Ireland (and Northern Ireland) every year. While Nomad doesn’t go to Ireland ourselves, we have a specialist partner (a BAR Member) in Ireland who conducts the packing and collection of our clients’ personal effects and brings them to our Peterborough warehouse. We then handle the removal the entire rest of the way ourselves, taking the goods all the way down to Greece in our own vehicles, with our own team and delivering to our client’s home in Greece. And for removals from Greece to Ireland the process is the same, but in reverse. And for removals to Greece from other locations, such as Spain, Portugal and the Scandinavian countries, we work with a partner company (BAR members like ourselves) to conduct the removal seamlessly from door-to-door. Nomad conducts the Greece leg of the journey and most of the international transport, while our partner takes over for the local leg of the journey. We’ve also moved many people over the years from Greece to the USA, from Greece to Canada, from Greece to Australia, from Greece to New Zealand and more. As specialists in Greece, our customers trust us to do a great job in this challenging part of the world, and to manage the entire process through our partners to ensure a fantastic result.